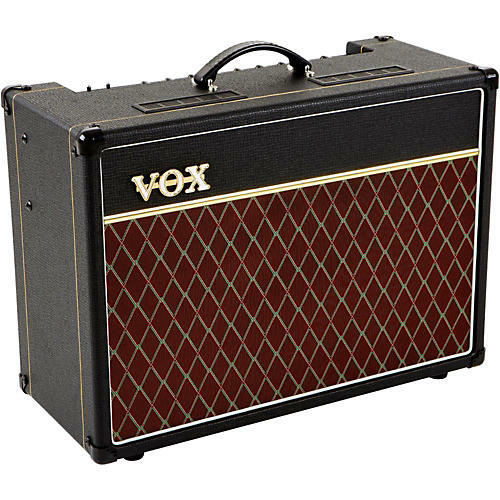 Experience the rich Vox sound that's overflowing with vintage tone. The AC15 combo makes use of three 12AX7 preamp tubes and uses pair of EL84 tubes to drive a single 12" Celestion Alnico Blue speaker. It offers a switchable 8/16 ohm output jack for powering an external speaker cabinet when you need to speak with a little more authority; using this jack will mute the internal speakers. Additionally, a second extension speaker jack allows you to run an extra 16 ohm cabinet along with the internal speakers for a fuller sound. Dimensions: 23.7" x 10.4" x 17.95"
Do your ears a favor and order today!